Do you need stabilisation software such as ProDRENALIN when you can use a gimbal? There are different opinions and philosophies about how action cam videos can best be stabilised. The key question is: Do you need stabilisation software when you can use a gimbal? There has recently been a brisk and very interesting discussion about this topic by users in the rc-network forum. There, the different user experiences with ProDRENALIN have been described in detail and in particular debated on whether software stabilisation, e.g. with ProDRENALIN, makes sense when there is also mechanical gimbal stabilisation. Clearly yes! Gimbals truly stabilise the camera and avoid camera shaking and bumpy videos. But not every action cam owner can use gimbals. With helmet cameras, attachment to the sail while surfing, on a skateboard, in a racing car or on the bike - there are simply situations where a gimbal is impractical or simply will not work. Mechanical stabilisation by means of a gimbal simply cannot straighten out the delicate vibrations of a motor. Camera gimbals have so-called IMU (inertial measurement unit) sensors that measure the position and speed of the camera, and then adjust the gimbal position to align the camera correctly. This control and sensor evaluation is carried out by the so-called GCU (gimbal control unit). But if the action cam experiences very fast movements, the calculations and adjustments are not accurate enough. How and where a gimbal can be used depends very much on the available space and the intended use. Usually, only users with experience in the respective field can say what is feasible. Do you have enough space on the board or on the machine? If this is not the case, then the use of gimbal in this area is impossible. 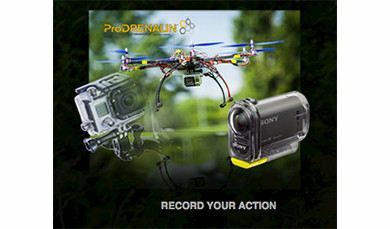 But that does not mean that you will then have to be satisfied with non-stabilised action videos: ProDRENALIN is the perfect solution for situations in which there is insufficient space for a gimbal, mechanical stabilisation is limited by motor or air vibrations or simply for stabilisation at home afterwards, if the gimbal has been forgotten.